Jonathan Haas is featured on the PHILIP GLASS Concerto Project Vol. I on Glass' Orange Mountain Music label. The recording includes Concerto Fantasy for Two Timpanists and Orchestra written by Glass for Jonathan. Conducted by Gerard Schwarz, the Royal Liverpool Philharmonic Orchestra performs the piece with Jonathan and Evelyn Glennie as timpani soloists. The Concerto was recorded in the acoustically wonderful Philharmonic Hall in Liverpool, January, 2004. According to an Orange Mountain Music statement, "The soloists were superb, exhibiting their well deserved recognition of being at the top of their respective fields. The orchestra, under Mr. Schwarz’s direction, performed beautifully. 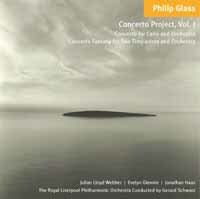 Orange Mountain Music is very happy to initiate Philip Glass’ Concerto Project with this disc." The booklet included with the CD contains the arist’s bios and there comments on working with and performing Philip Glass’ music. Also on this recording is Glass' Concerto for Cello and Orchestra. Jonathan Haas, known as a virtuoso musician who has raised the timpani's status to that of a solo instrument, has released 18th Century Concertos for Timpani and Orchestra on Sunset Records, a recording emboding the spirit of a modern-day artist exploring a repertoire that had been lost in music history. The CD features three pieces written in the 1700s to showcase the timpani, Johann Fischer's Symphony for Eight Timpani and Orchestra and Georg Druschetzky's Partita In C Major and Concerto For Oboe, Eight Timpani and Orchestra. Jonathan is the soloist on the three works, performing on all eight timpani with the Bournemouth Sinfonietta conducted by Harold Farberman. Gordon Hunt is the oboe soloist. "I discovered early in my career that audiences could easily distinguish pitches and enjoy the intricate melodic lines produced on the timpani," says Jonathan. "So, in addition to commissioning new works, I began searching for music from the past that spotlighted them. Musicologist Harrison Powley, whose program notes are featured in the 18th Century CD, brought these pieces to my attention." Symphony for Eight Timpani and Orchestra was written by Johann Carl Christian Fischer (1752-1807) prior to 1792 when he was employed by Herzog Friedrich Franz I. It includes a written-out cadenza at the end of the first movement. The opening allegro is in concerto form with the timpani functioning first as part of the ensemble and second as a solo instrument playing bass-like patterns or doubling the melody. The adagio movement provides a brief transition to the rondo-like finale. Improvisations using three- and four-note chords are added to this passage, and in keeping with the improvisational style of 18th-century military timpani playing, further embellishment is added to the solo part throughout the entire work. The Bohemian composer Georg Druschetzky (1745-1819) first learned and refined his musical craft not within the circles of the aristocracy but as a practicing musician (both oboist and timpanist) employed by the state. That he was a professional timpanist made him sensitive to the melodic possibilities of the instrument long before modern-day pedal mechanisms increased its melodic potential. His approach to writing for multiple timpani is clearly seen in his Partita in C Major for Six Timpani and Orchestra, a short tuneful work in four movements. Lightly scored for flute, two oboes, two horns, two trumpets, and strings, the solo timpanist performs a variety of melodic material. The Concerto For Oboe, Eight Timpani and Orchestra, a unique work in the Sinfonia-concertante tradition of the late 18th century, is a tour de force for the oboist as well as the timpanist. No other work from the classic era for this pair of soloists and orchestra has yet been discovered. Written around 1800 when Druschetzky was in Hungary, the piece contains three movements. The several cadenzas in the concerto are improvised by the performers, each soloist taking his turn with the timpanist leading the way. The colorful scoring of clarinets, bassoons, and timpani (two drums being struck simultaneously in thirds) is a technique that predated by perhaps twenty years Beethoven's use of striking both drums at once in the third movement of his Ninth Symphony. This recording features a sound rarely heard in jazz: the timpani, those deep bowled kettledrums that are tuned so as to play clearly distinguished pitches. Jonathan Haas was inspired by the recordings of Vic Berton (who is considered the first jazz timpanist) and Ian Finkel (a great jazz musician). It was instantly agreed that it was time for the kettledrums to get their chance to swing. 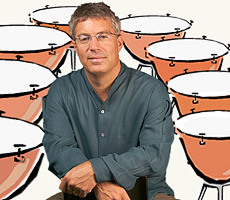 The CD is named for Jonathan's jazz group and features innovative renderings of jazz compositions featuring "hot timpani" in front of a full jazz ensemble. His rediscovery of Duke Ellington’s brilliant composition for jazz timpani, "Tympaturbably Blue," is included on this recording, as are other jazz standards played on a set of ten kettledrums. In addition to Duke Ellington, composers of the tracks include Hoagy Carmichael, Eddie Durham and Lionel Hampton.